Chalkboard-like in execution, this Backwoods Brittle Farm Store Branding plays upon the sensibilities and psychology of fans of the Lands at Hillside Farms. Both the Lands at Hillside Farm Store and the Trucksville-based Backwoods Brittle Company are champions of the shop local ethos. Rustic, homespun, and farm fresh are keynotes of the marketing position. 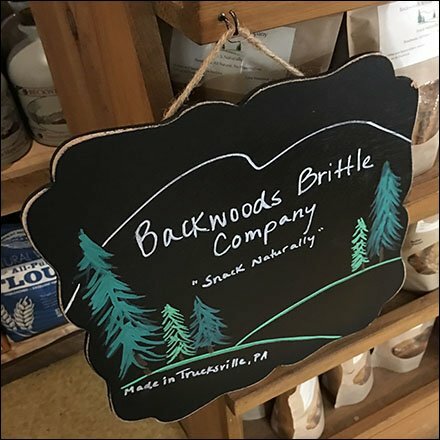 This Backwoods Brittle Farm Store Branding seen among many similar handcrafted promotions in Shavertown, PA.